During our time in Japan, we have naturally noticed that there is just so much that is different. Different than we expected and also different from what we are used to. Some of these things are small surprises, like the crazy numbers of ferris wheels and sky-reaching towers. Some are more obvious differences, like the fact that we haven’t seen any places of worship besides temples and shrines (though we did see Mormons on riding around on their bikes). And some are probably just silly–like how seeing an overweight Japanese person is so unusual you actually take notice. With all of these differences and surprises, we thought we would take some time to highlight some of the more interesting things we’ve observed. 1. Eggs, eggs everywhere–That’s right, believe it or not, the Japanese love their eggs. This may seem like a strange thing for us to notice, but seriously, you can’t miss it. One of the first quick meals we had here was an egg salad sandwich from the convenience store at the airport. We figured they were just catering to Americans and didn’t think anything of it. Since then, we have seen egg salad everywhere, from sandwiches to fillings inside of pastries. In addition to that variety of egg, we are constantly finding sushi rolls filled with steamed egg and vegetables. I thought it was tofu at first, but was surprised when the chef told me I was wrong. Our ramen noodles had the optional hard boiled egg on top and the Okonomyaki (savory pancake) has an egg making up one whole side of it. I’ve been to Japanese restaurants in the states and I swear I’ve never noticed a proliferation of eggs. On a related note, we’ve seen no chickens. Curious. 2. 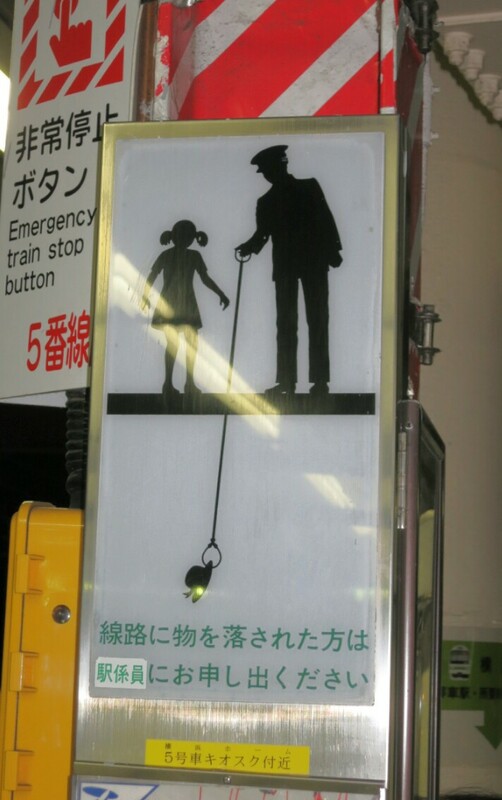 Super Polite People–Okay, perhaps it is no surprise that the Japanese people are super polite. In fact, this is pretty much a stereotype that many Americans have of this country. However, we had no idea how far this behavior would extend. We already mentioned that people line up at the train doors rather than all crowding around in a mass. Okay, that helps things be more organized, we can understand. But even when the train is crazy-crowded, there is no shoving or shouldering past one another to get on or off. People here are constantly saying “Domo” (thank-you) and bowing to you in greeting or departure. But our favorite example came when we heard a fire truck barreling through a crowded intersection. They were shouting over their loud speaker for people to get out of the way. Of course, since it was all in Japanese, we only caught some of what he was saying, but he started the whole thing with “Konnichiwa,” essentially saying “Hello, good afternoon” before telling them to get the hell out of the road. We thought that was the perfect exemplar of their incredibly polite behavior. 3. 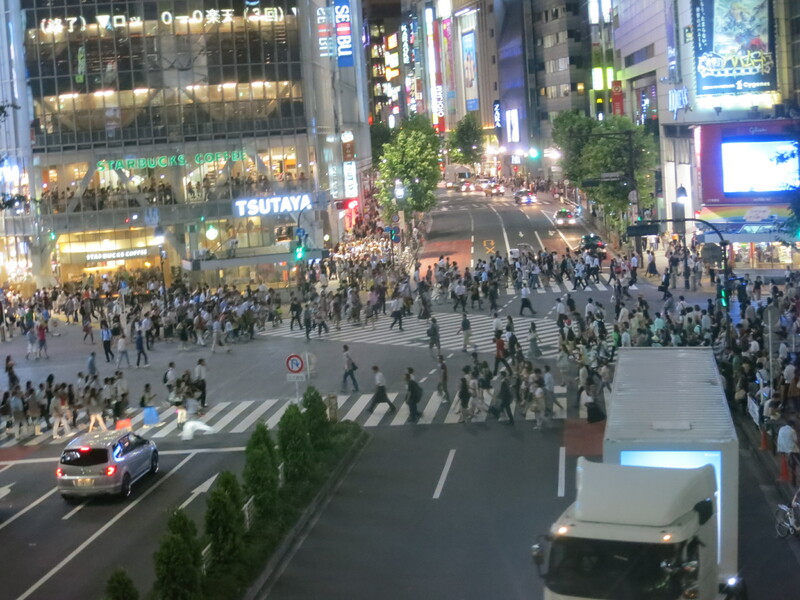 People, People Everywhere–Okay, we knew Tokyo would be crowded. It is a big city with tons of people and Asia in general has the reputation for being overpopulated in many areas. Fine, we get it. What we didn’t get was that the entire country would be jam packed with people. Whether it is a small town or a major city, it seems there are people everywhere. We didn’t really realize how crowded it is until we were on Miyajima, a small island outside of Hiroshima. Here, a ferry boat ride away, was the first place in Japan (other than a temple garden) where we found ourselves with some room to breathe. We’ve lived in New York City for six years so we know what crowds can be like. A typically crowded New York street is nothing compared to what we’ve seen here. It is like Christmas at Rockefeller Center all the time, especially at the train stations. We are not saying it is a bad thing that there are people all over, but it certainly has made us take notice and appreciate the quiet moments. 4. Fashionistas–First, let me remind you that it is crazy hot here right now. There is a ton of humidity, the sun is always shining, and people here walk a lot. I am always a sweaty disaster looking like I can barely breathe. On the contrary, the Japanese women look totally unfazed. No matter where we are, whether it is a major tourist attraction or a small coffee shop, Japanese women are so well put together with nary a drop of sweat anywhere. They are always wearing full make-up, quite often cute skirts, and 75% of them are wearing high heels. (In order to keep themselves looking dry and fresh, most of them carry “sweat towels” to dab their faces.) These are not all women who are going to and from work, either. This is just part of the culture here. Interestingly, almost all of the women wear some sort of stocking or hosiery all summer long. It is completely normal to see a woman wearing stockings in the middle of summer with her open-toed sandals. However, if they choose not to wear full stockings, many of them wear some sort of cute sock with their high heels and sandals. It looks strange at first, but it is really cute and I bet it makes those shoes much more comfortable. They sure look better than I do! 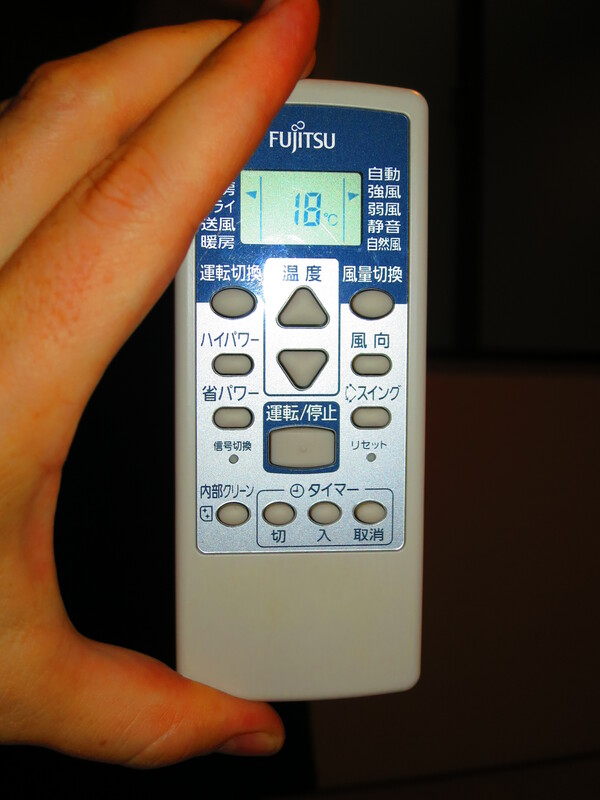 If you think this Air Conditioning remote looks confusing, imagine the toilets! 5. Awesome and Confounding Bathrooms Experience–The public bathrooms here vary from being completely awesome to totally disgusting. I guess this is true in most places. However, there are a few things that make their bathrooms particularly unique. The first is the amazingly high-tech toilets found in some of the nicer restrooms. These toilets are hooked up to a panel on the wall and they do all kinds of fun things. The toilet seat can raise automatically, they spray water to clean you (you can adjust the pressure of the spray and the temperature), it will blow you dry with warm air, spray deodorizer and give you multiple levels of flushing. These are very refreshing bathroom visits. In addition, even if the toilet isn’t this fancy, almost all of the restrooms I went into have a sensor on the wall so as soon as you sit down, a fake flushing sound starts happening. This allows for a little background noise and some privacy to prevent any possible stage fright. (Note: Phil said the men’s restrooms were not this fun.) With all of these cool gadgets, you would think they would have amazing sinks and high-tech hand dryers. To the contrary. The bathrooms everywhere here do not have any air dryers or paper towels to dry your hands after you wash them! We don’t understand. Why can’t there be something to dry our hands? Why do you want us dripping wet as we leave the bathroom? Phil kept forgetting about the lack of towels and he would splash water on his face and have nowhere to dry it. It’s very frustrating, but also kind of amusing. Of course, in any foreign country there are tons of differences both big and small, and getting to discover these is part of the fun of travel. We were surprised to see both men and women dressed in traditional kimonos. We figured this was outdated, but as it turns out this is common for formal occasions like weddings, funerals and fancy parties. Another small surprise was the overwhelming number of vending machines. They are everywhere, even in people’s front yards. And they sell both hot and cold drinks. Hot coffee in a can! Genius. We look forward to continuing our journey in Asia to see how these countries compare with one another and with the U.S. No matter what, we will leave all of them with some amusing stories and having learned a lot about a new culture. And that is what this is all about! 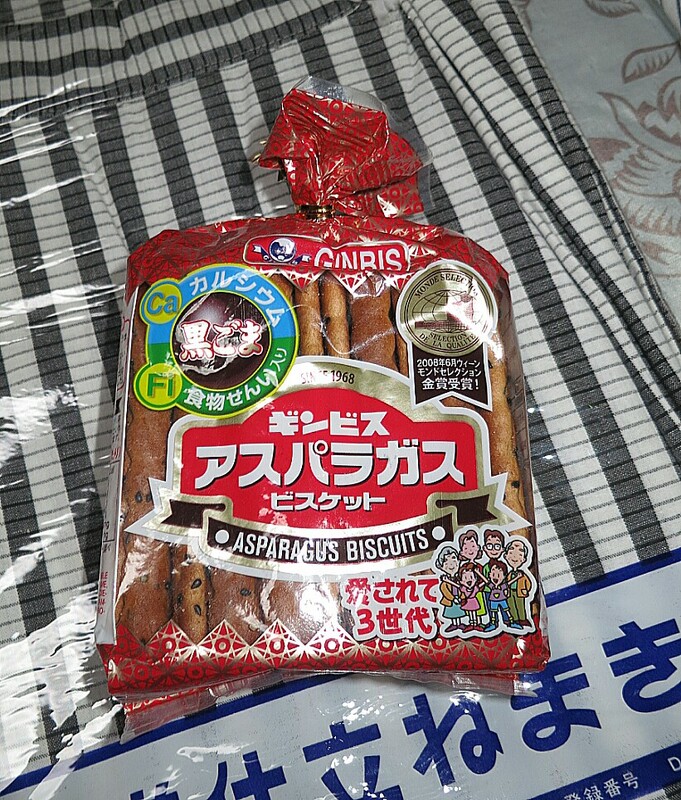 One of Brooke’s new favorite Japan snacks: Asparagus Biscuits! We did it! Brooke and I conquered and vanquished Mt. Fuji. We managed to climb all the way up and all the way back down Japan’s tallest peak/largest mountain/giant dormant volcano. There are no two ways about it: it was a hard climb. 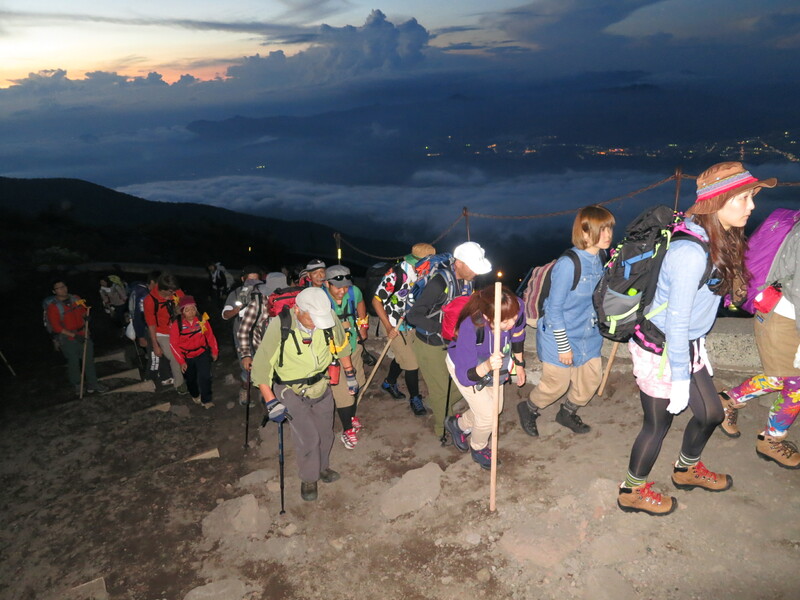 Leg muscles churning, cardio flowing as we hiked from 2,700 meters to the summit at a whopping 3,776 meters We figured that this was a can’t miss excursion –especially since we were lucky to be here during the brief Fuji climbing season of July 1st– August 31st. Check that one off the list. The day has been hard on the feet. And the calves. And the shoulders. Brooke said it was the most strenuous hike she’s ever done and it was the biggest climb I’ve done in many years. We’re tired, sore and a bit exhausted, but thrilled we were able to complete the climb.What a way to end our visit to Japan! 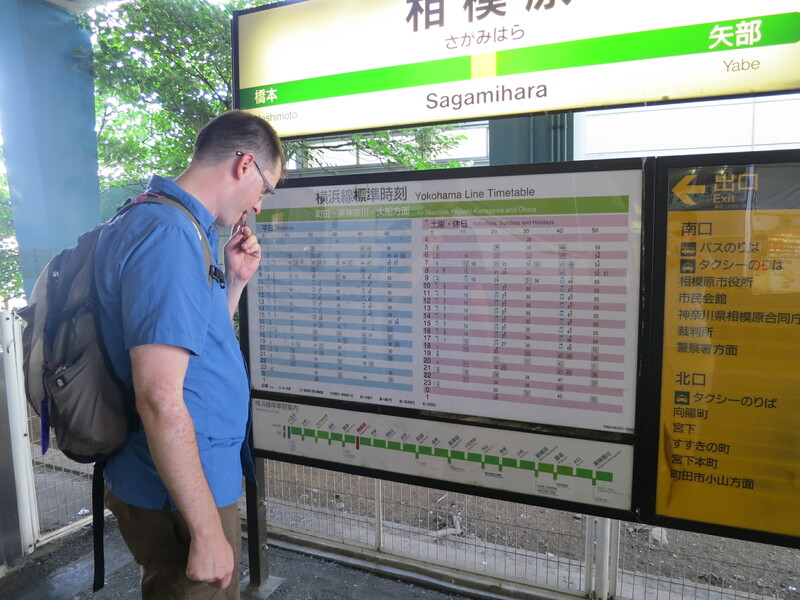 We set off early in the morning to make our way from Sagamihara to the Mt. Fuji area which involved four trains, a bus and an angry station agent who yelled at us in Japanese. On the long ride out, we watched the landscape change from big city to scenic, hilly countryside. 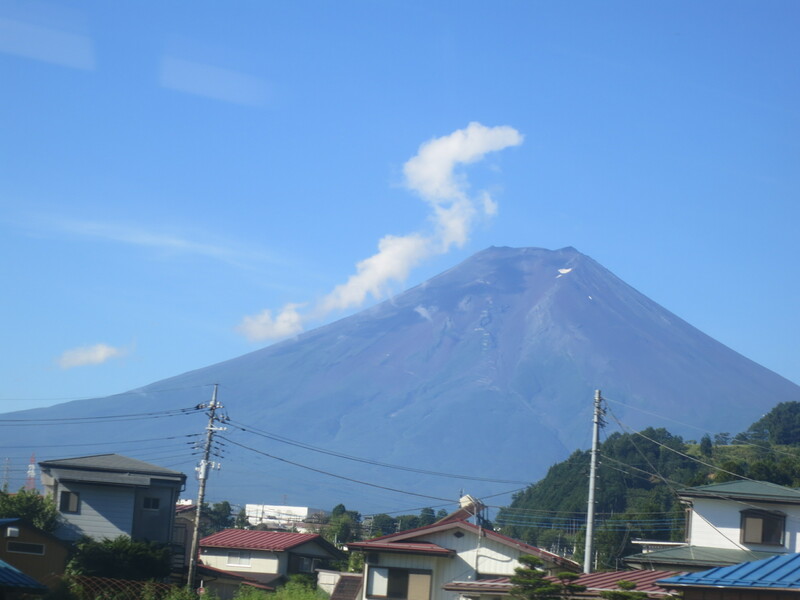 We had a glimpse of Fuji from the train window; our first chance to size up what we’re going to be up climbing in the hours ahead. We rode the bus up to the fifth station which, at an elevation of about 7,800 feet, is where most hikers begin their climb. It was packed with some people just completing a sunrise climb, to others getting started to even more who were just hanging out. But to be fair, it seems to be packed with people just about everywhere in Japan. Onward! 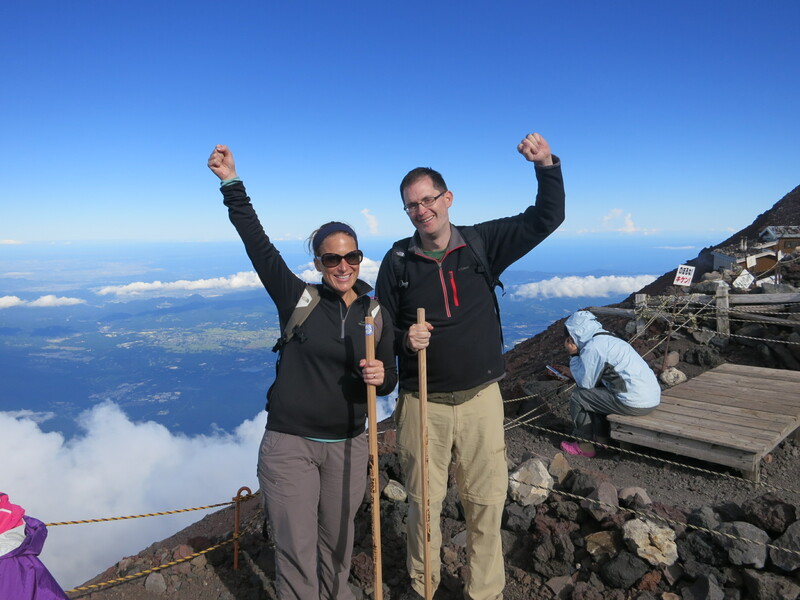 We began our mountain climb with a walk down the trail to the lower section of Fuji. Brooke and I both managed to dodge any symptoms of altitude sickness of which we had been warned. And the weather, which can change on a dime, held up wonderfully during our entire time on the mountain. 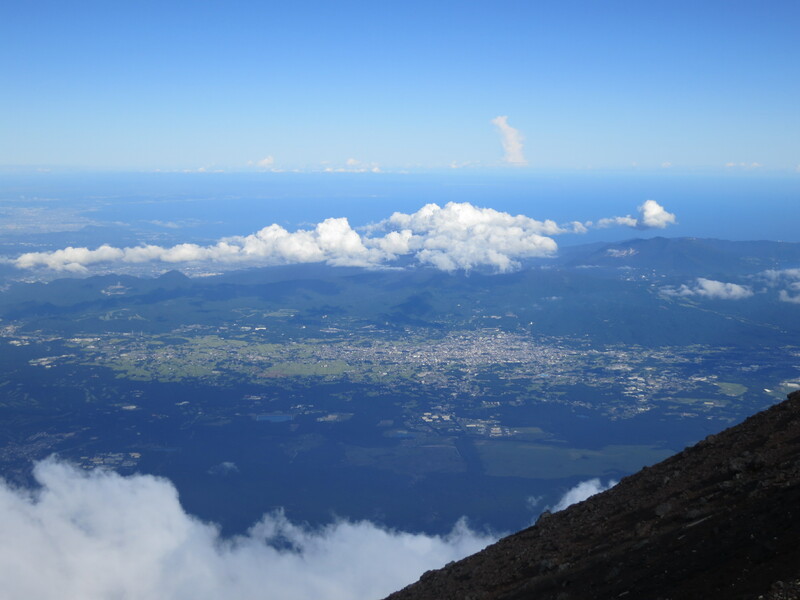 Since Fuji-San sticks out alone, we were quickly up higher than anything within sight. The mountain truly does tower over the country side. 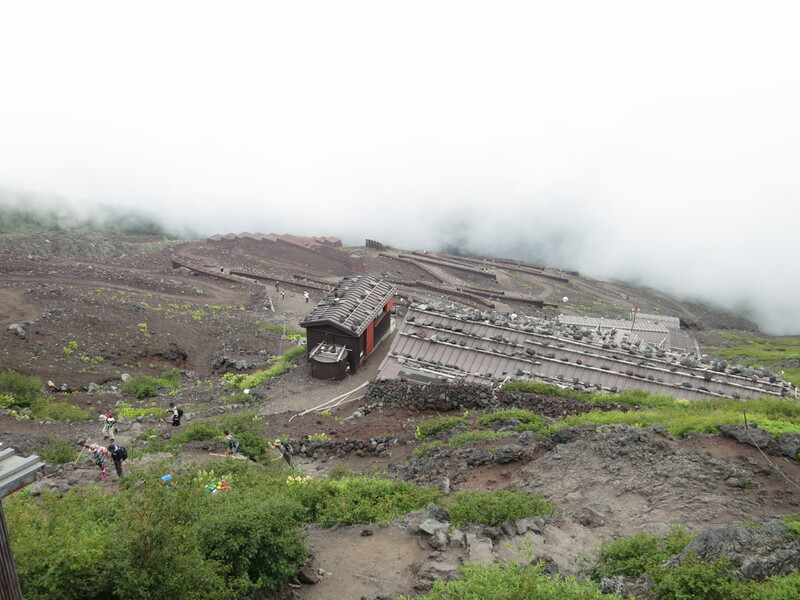 There are huts and stations at different altitudes up the mountain. 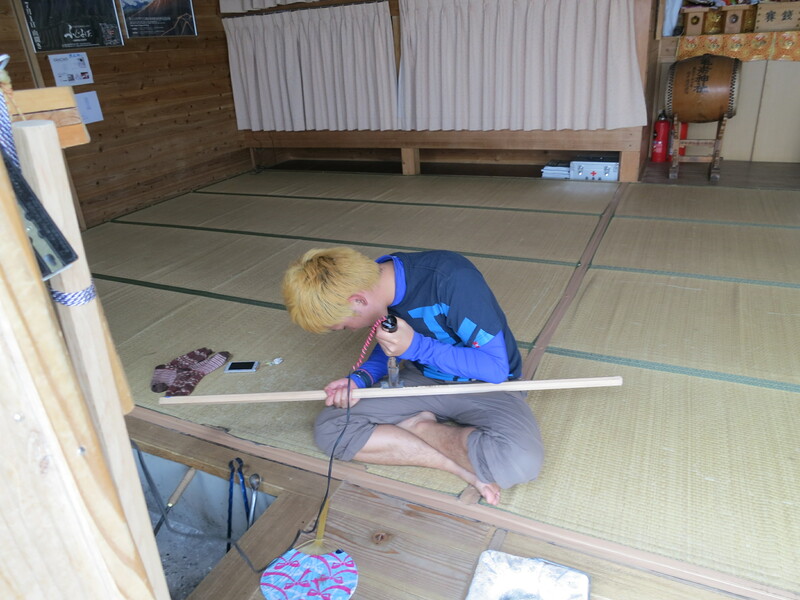 For 200 Yen (about $2.50), each hut will “stamp” your walking stick (a simple wood stick purchased before starting the hike) with a custom wood burn. In lieu of views on the way up due to some morning clouds, we have stamped walking sticks to commemorate our experience. The further you go, you find that the climb becomes steeper and the bottled water becomes more expensive. We certainly passed people who were headed back down after giving up on reaching the summit. By the time we even reached the 7th Station, that felt like an accomplishment in itself. One of the most surprising thing we saw were a number of people enjoying a cigarette during their climbing breaks. Come on, people! Fresh mountain air! Lung capacity! When the clouds did clear, we could see back down on how far we’d already climbed. Whew! It became a little bit harder to catch our breath at 9,000 feet and breaks became more frequent, but we were not to be defeated! At about 1.5 km away, we could SEE the top. We found ourselves even more determined to reach the summit when we saw 7-year old children and grandmothers on the climb. Ego tends to click in when you start thinking there is no way that they’re going to climb the mountain and I’m not! Eventually and with much rejoicing, Brooke and I reached the summit in about six hours – which is an about average time but it felt like a huge win. A true accomplishment! Going up station by station. Bit by bit. Man, we can’t emphasise enough how difficult those last 400 meters were. 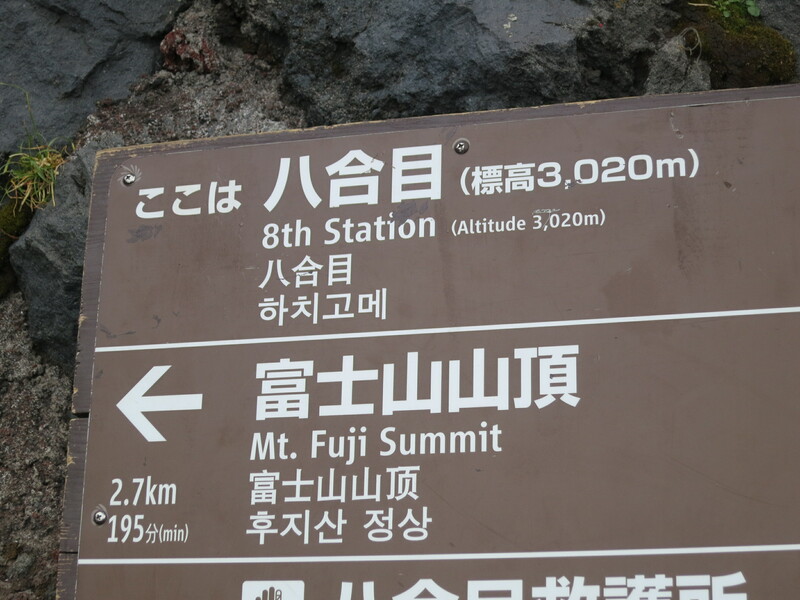 They saved the toughest climb for the end – that ascent from the 9th station is just a killer. Lots of breaks. Lots of slow going. But you start getting in the mentality of just putting one foot in front of the other to make it to the top (as inspired by here). After a bit of resting and examining the top, we began our descent. 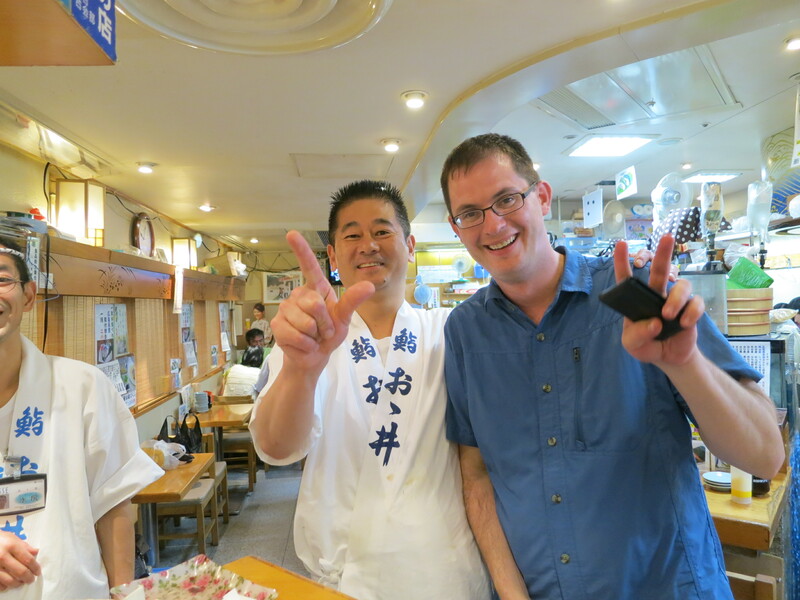 On the way down, we met Yon and Sean – travelers out of Santa Barbara, California also visiting Japan. We were treated to some extraordinary views below as the sky cleared. Visibility for miles meant that we even spotted Tokyo’s Sky Tree Tower way in the distance. Contrary to what people had told us, coming down was NOT harder than climbing up. We were able to chat leisurely the whole way down while half-walking, half-sliding on loose rock (with many near falls) and curving, switch back trails. All in all, it made for a comparatively quick walk. Looking back up at the summit, I determined that hell would be being told to turn around and climb back up. We made the descent in three hours. Also not bad! We broke out the flashlights for the final kilometers as the sun set. Along the way, we passed large groups of people with headlamps who were just starting a night climb – which seems a bit miserable to us, but to each their own. Upon reaching our original starting point, we were exhausted but had made some new friends. Yon, Sean, Brooke and I ended our ten hours at Mt. Fuji sitting on a curb, toasting Kirin Beer fresh from a vending machine. That was one beer that went down easy. While waiting on the bus, Brooke gave me the best gift she has even given me: half of her cold, delicious beer. 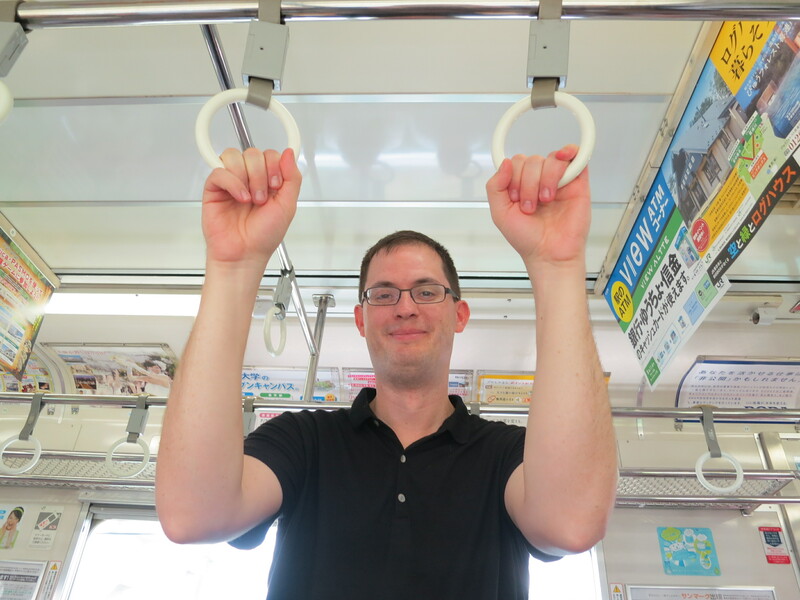 Riding the bus away from Fuji, we traded notes with some other Americans who made the climb. Wherever we go, we keep finding lots of well-traveled westerners to converse with which is kinda fun. Overall, today was a fantastic day that ended with us feeling tired but accomplished. 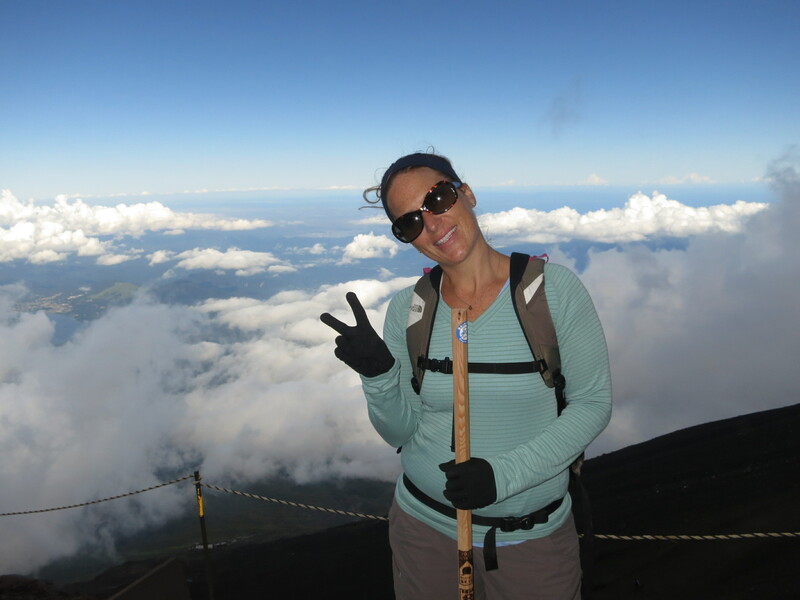 And now we can say that we’ve climbed to the top of Japan’s tallest mountain. We climbed Mt. Fuji!And that’s pretty cool. PS- I had this catchy, funny, odd number from the video mash-up group Fall On Your Sword in my head the whole time I was climbing, so I thought I would share. Brooke in the clouds high above! Signs pointing our way to the top! The number one benefit of purchasing the seven day Japan Rail Pass (that we mentioned earlier) is that it has allowed us to ride all of the JR trains including the famed Shinkansen (pronounced like “Wisconsin”) AKA the bullet train. 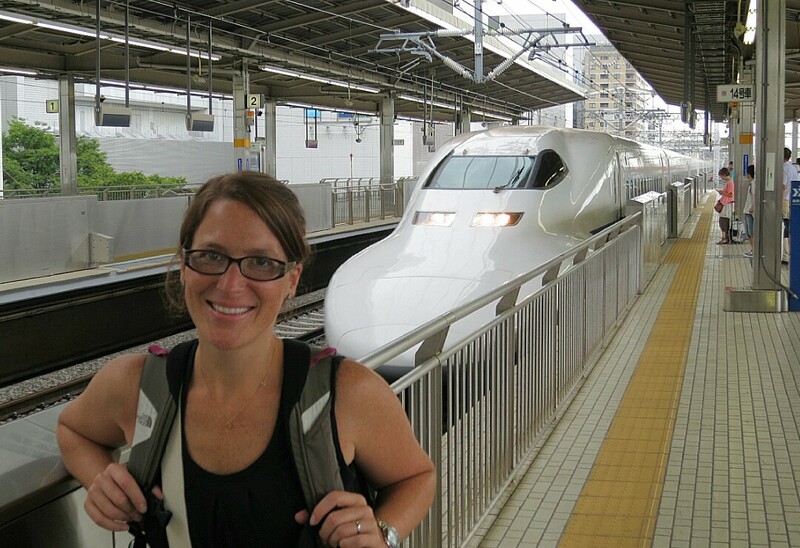 Talk about a wonderful, lightning fast way to trek through Japan! We knew it would be a speedy ride, but Sweet Sassy Molassy! That train is fast! Amtrak’s Acela service crawls in comparison. 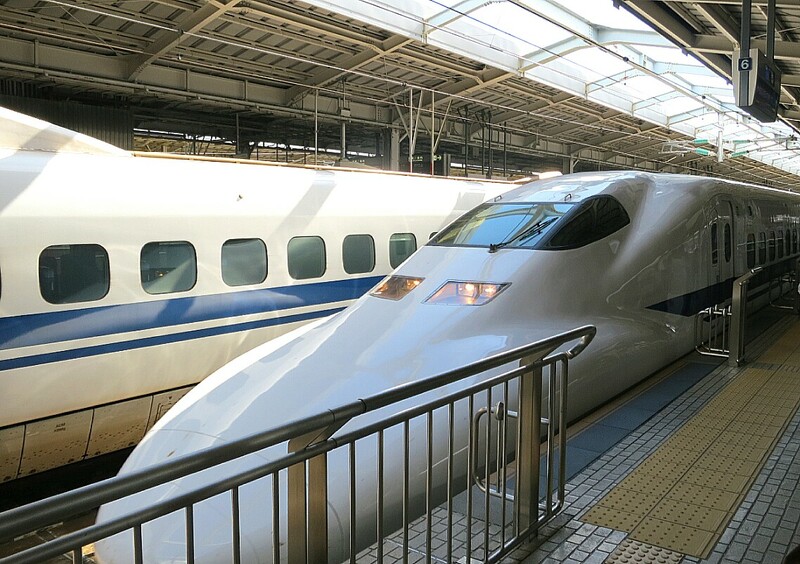 A sensational, practical, relaxing and enjoyable way to travel, the Shinkansen rail network spans the islands of Japan from tip to toe providing the fastest, smoothest and among the most comfortable train ride that I have ever enjoyed. Shinkansen service is near legend in Japan and it’s easy to see why. These trains are a technology and transportation achievement that should have other countries drooling. The Shinkansen trains themselves have a fierce and futuristic look – even though the trains have been around for years and years. Their signature look embodies speed. Each sleek car is white with a signature single blue line that streaks down the center of the outside. These aerodynamically shaped trains are also considerably longer than most other trains I’ve seen with some running up to sixteen cars. Each train can hold over 1,500 passengers; when they pull in the station they seem to keep going and going. The interior is equally as nice: comfortable quiet cars, and reclining seats. They are very clean trains with attentive in-seat service from an ever-bowing crew. In that regard, we’re starting to expect nothing less from the Japanese! And there are just so many Shinkansen are on the schedule running each day! 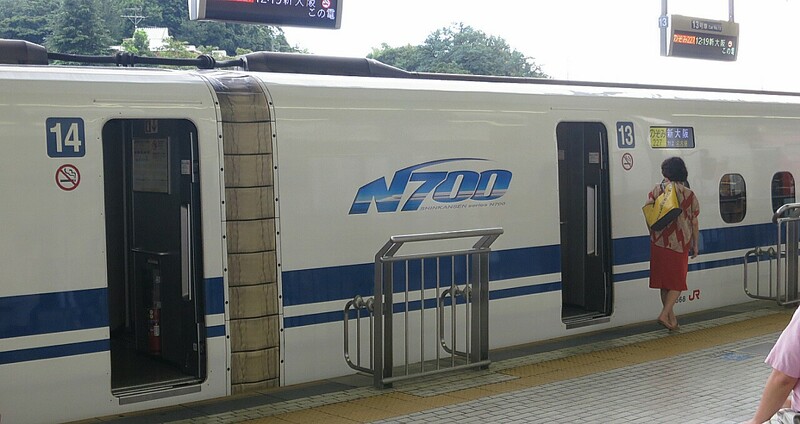 The frequency is surprising: wait ten minutes in a station and you might see a half dozen Shinkansens zoom through. It’s a little thrilling each time one roars into the station. But above all else, it is simply a wonderful way to see the country. Sit back, tilt the chair a bit, and gaze through the oversized window. And these suckers are fast and getting faster. Each generation of engines are apparently a touch speedier than the previous. Speeds of up to 180-200 MPH makes looking out the window a little challenging. Traveling at this new speed, closer objects are hard to focus on before they are out of sight. 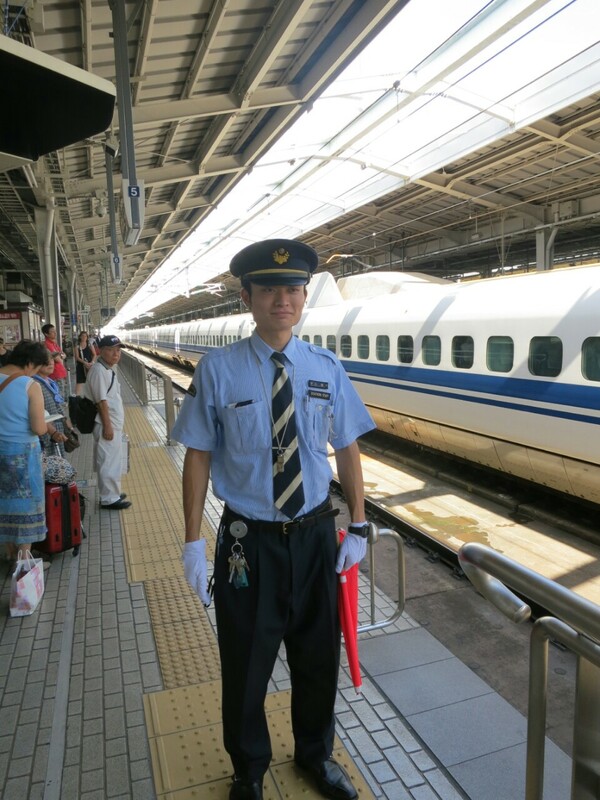 We rode the Shinkansen from Tokyo to Kyoto and then Kyoto to Hiroshima and finally back to Tokyo. It would have been great if we had just a smidge more time to head north, but that’s becoming our mantra lately: If only we had a bit more time! 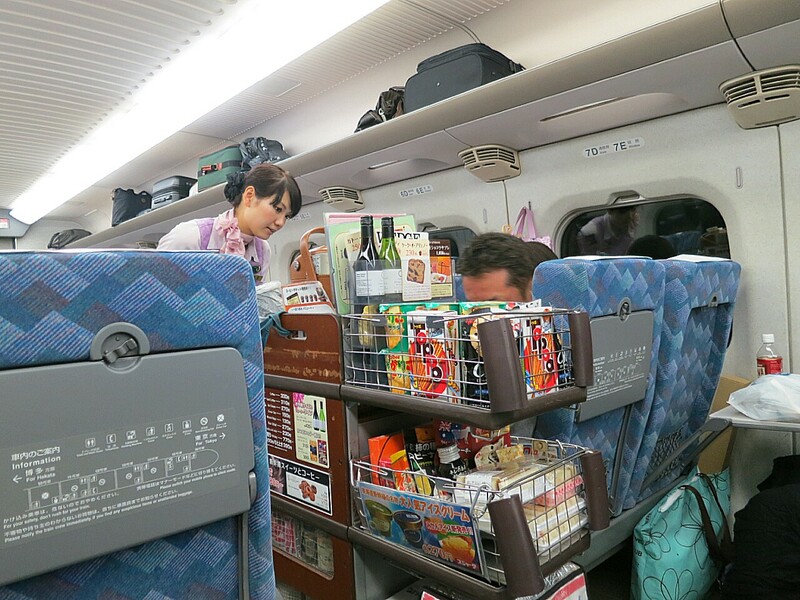 But buyer beware – these Shinkansen tickets can be expensive! That handy-dandy Japan Rail pass included our fees, but we estimate our three train tickets could have cost upwards of $500 each. The costs seem justifiable when you start to add up all of the infrastructure that must have been required here. Riding the line on elevated tracks (no ground level track-crossings here), curves on a very small grade, and through endless tunnels & bridges, it breaks my four-function brain calculator to add up what the infrastructure demands must have been. And it looks like it is paying off- most trains we rode on were sold out and it seems to be the preferred method of travel through the country. Who needs airports when a Shinkansen stop is likely a short jaunt from your home! Hmmm…I wonder if there is a Shinkansen route that will take us to the top of Mt. Fuji tomorrow? Man, what a cool ride. After visiting Peace Memorial Park and Museum in Hiroshima, we decided we needed to do something different. Something totally unrelated to the atomic bomb and the events which follwed. One of the things that is so great about this trip is the fact that we find ourselves in interesting and unique places that we never even knew existed even a month ago. 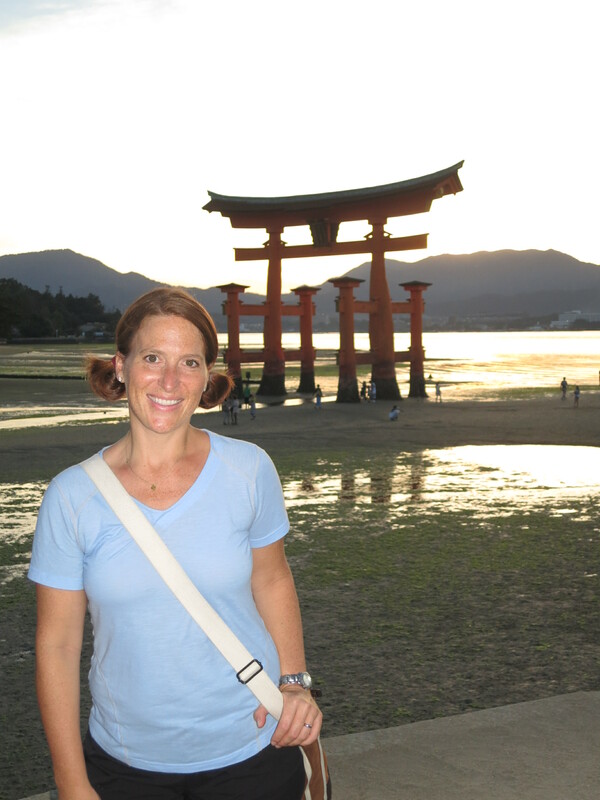 Miyajima Island, about 45 minutes outside of Hiroshima, is just that place. 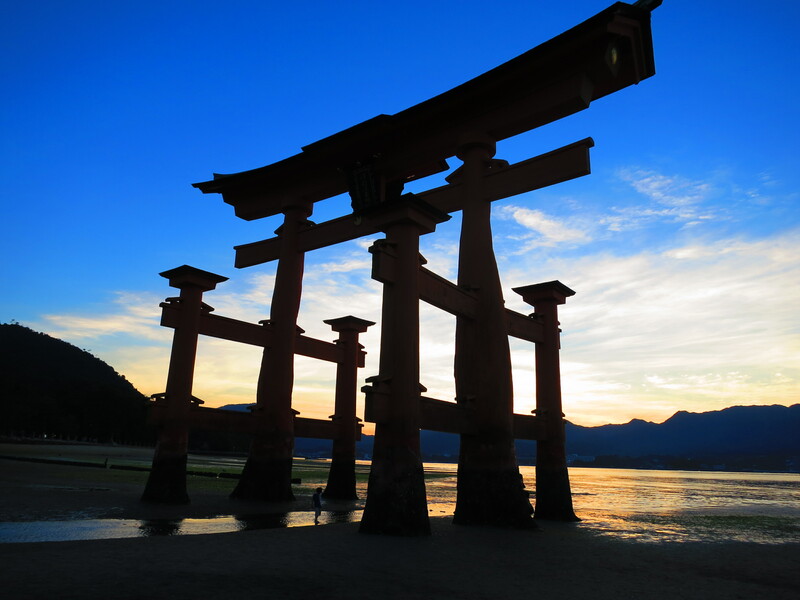 Miyajima is a renowned tourist attraction in Japan and is most widely known for its beautiful shrine gate. When I read the descriptions, what drew me most to visiting this island is the flame burning near the temple at the top. I know this sounds strange, but apparently this flame has been burning continually since it was lit 1,200 years ago. Twelve hundred years! That is utterly amazing. So, without knowing much more than this, we made the journey out of Hiroshima, first taking the street car, then the train, then a ferry! Many modes of transportation are required to get there, but Miyajima is totally worth it. Once again, our JR Pass paid for itself as the trip out and back didn’t cost us a single Yen. 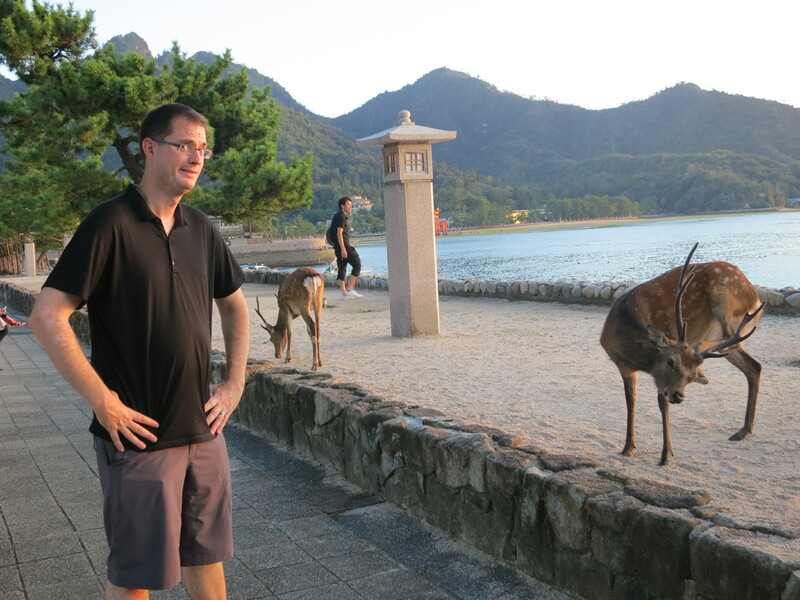 When we first stepped off the short ferry ride and began walking around the island one thing struck us immediately–the amount of “wild” deer. I say “wild” because they really seem quite domesticated and docile. Having grown up in Ohio, I am used to deer which run away at the sound of people or cars. I expect deer to be skittish and elusive. Not these deer. They walk amongst the people like they are pets. People are told not to feed them, and we didn’t see any of that happening, but people were definitely petting the deer and even touching their antlers. Phil and I kept our distance, but at one point the deer came right up to me, sniffed my bag and kept going. We saw one deer steel a bag of snacks from the back of a man’s wheelchair. It was very strange and a little unsettling. 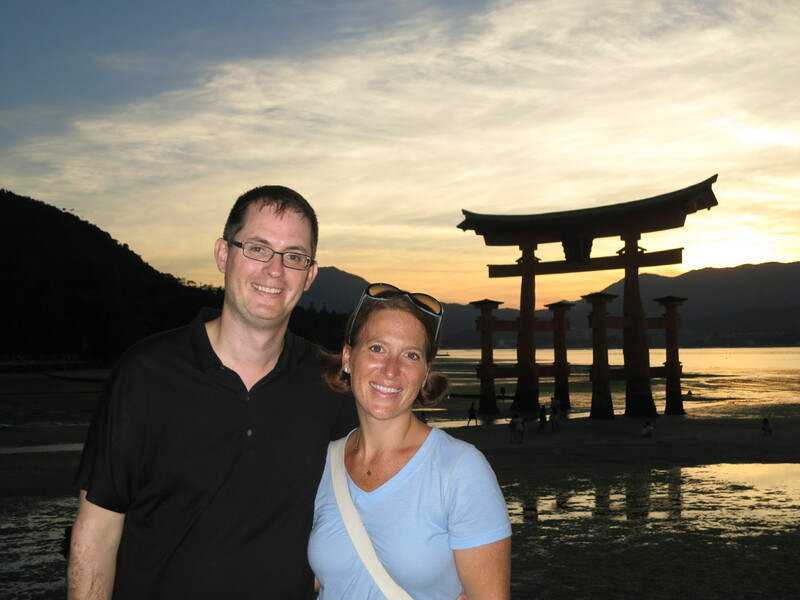 Because we got there so close to sunset, we were unable to go up the ropeway which would have taken us to the 1200 year old flame, but it was totally worth missing to get to view the brilliant red shrine gate of Itsukushima-jinja at sunset. This huge gate is set out in the water, so at low tide visitors can walk up to it and at high tide it looks as though it is floating. It is one of the most sensational sights we have seen thus far. 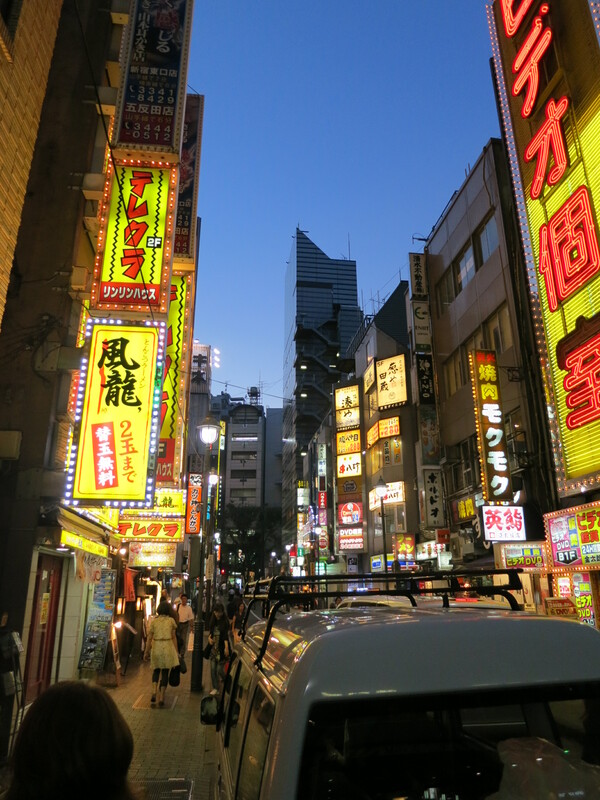 We realized that most of our time in Japan has been spent in bustling cities and crowded areas. 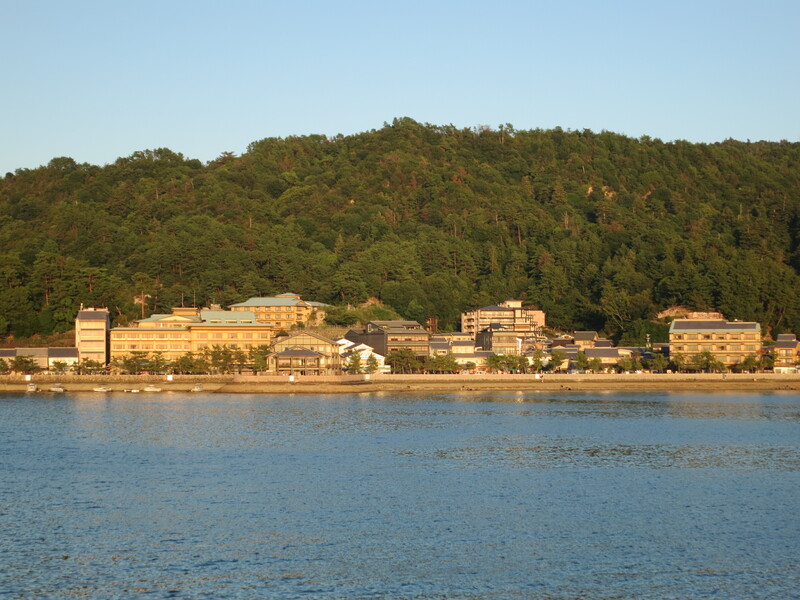 Miyajima at sunset is the complete opposite. Sure, lots of people were there taking photos and watching the sun slide behind the mountains, but it was incredibly quiet and tranquil. We sat for almost an hour, watching the sun go down and the stars come out. It was really majestic. 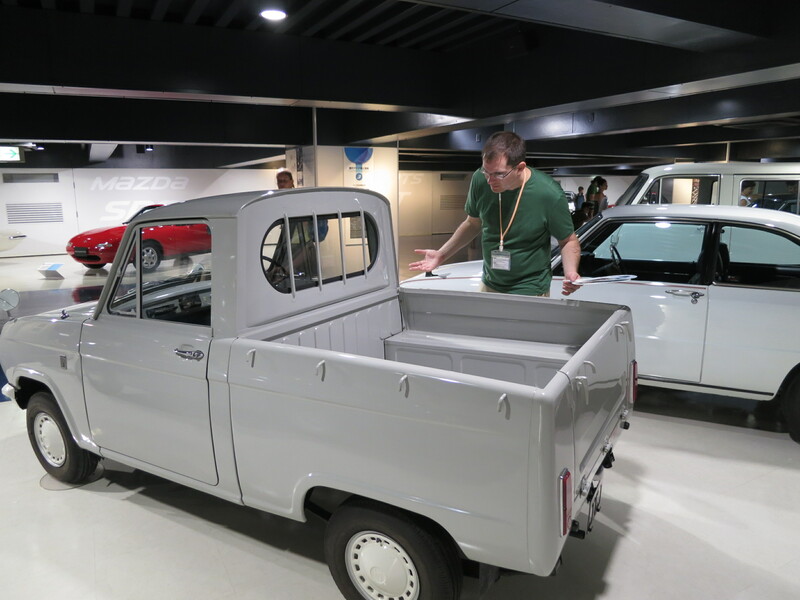 Our final morning in Hiroshima found us touring the Mazda Museum. I’m not really a car buff and I certainly don’t know what makes Mazda different from any other type of car, but it was so great getting to take this tour. First of all, the facilities are absolutely huge. We were not allowed to take pictures of the outside buildings, but did learn that the assembly line is 7km long, the longest in the world. In addition, this Mazda facility has its own private bridge which is 500 meters long making it one of the longest privately owned bridges in the world. They also have a private port where their ships transport up to 5000 cars at a time to different areas overseas (it takes 14 days to transport a car from Hiroshima to Northern California). The tour was really great, starting with a little history of the company and moving through the years. Of course there were 2 major parts which were most spectacular. First, we got to see some of the classic Mazda cars. They were absolutely beautiful. We even saw a Cosmo Sport, a sports car from the sixties which is very rare because it is entirely hand made; there were only 1200 in existence. 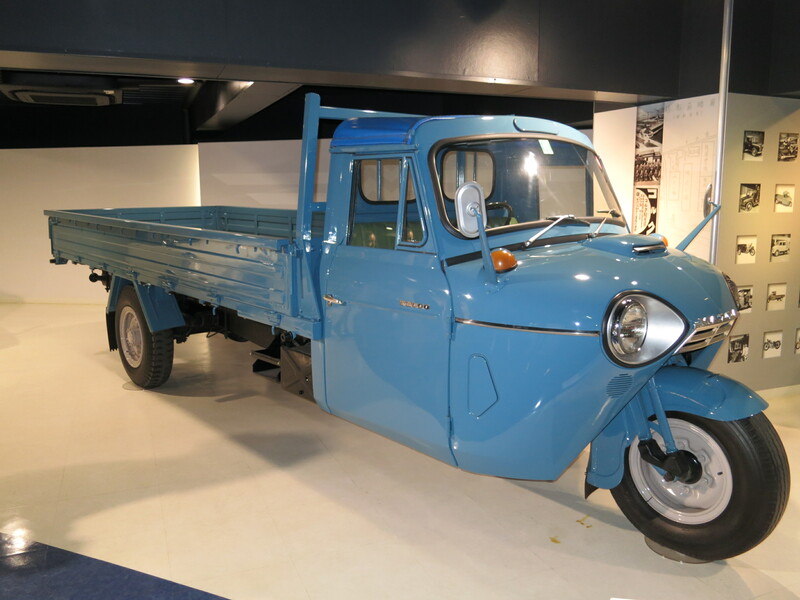 I also thought the 3-wheeled trucks were awesove me–these were the first motor-vehicles Mazda ever made. I think I could drive one of these as my everyday vehicle! But to be honest, the best part of tour was actually getting to see the assembly line. It was amazing. The cars would creep down the conveyer belt while workers put different parts into place. We were surprised to see different models of cars being made on the same line. We figured that would get confusing, but they clearly have a way of keeping it all straight. We were especially fascinated by the machine that put adhesive around the edges of the windows, windshields and rear windows. It knew exactly where to go–it really is like magic. The cars are put together from start to finish at this plant, and it takes about 15 hours per car. They make about 1,000 cars per day. Absolutely amazing. Unfortunately, we weren’t allowed to take pictures of the assembly line, but just trust me when I tell you it is one of the most intricate and interesting things you can see–we could have stood there watching all day. 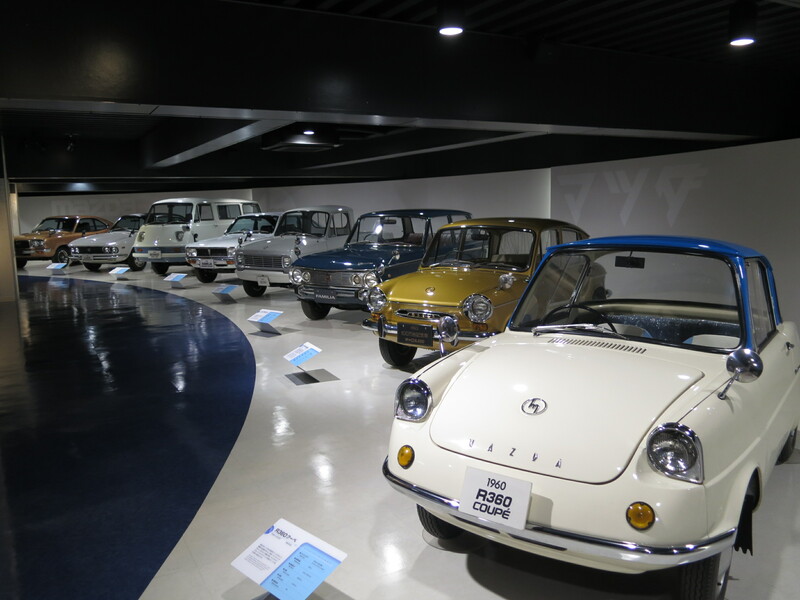 After visiting the Mazda Museum, we decided it was time to leave Hiroshima and head back towards Tokyo. We can’t believe how quickly our time in Japan is going, although that seems to be a pretty consistent theme of our trip so far. Now, we spend the day buying souvenirs and shipping some things home (we have the benefit of using the U.S. Postal Service on base). However, the most important thing we are going to do today is get prepared for tomorrow–the day we climb Japan’s tallest peak – Mt. Fuji! The shrine gate at sunset is truly a sight to behold. The tide is coming in at this moment, but at high tide it looks like it is floating. 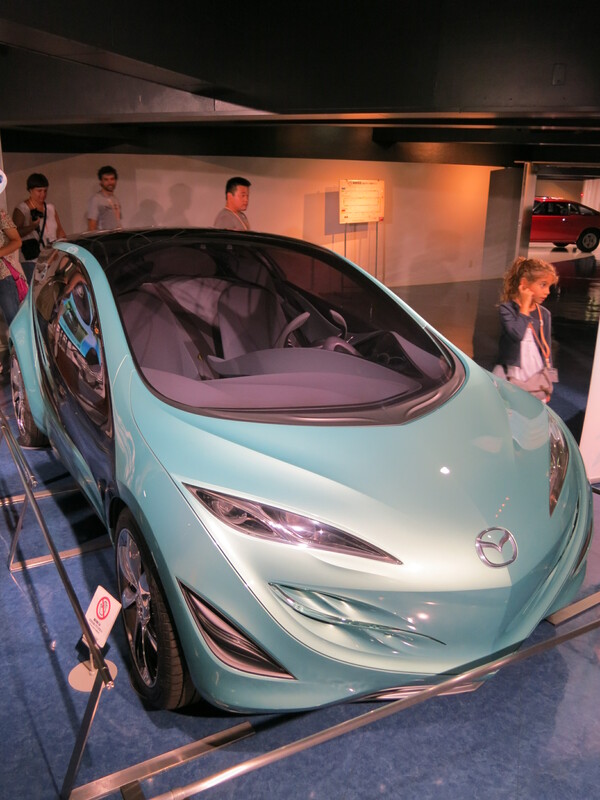 One of Mazda’s concept cars. In an effort to “go green” there are grooves on the roof to collect rain water, filter it, and pour into a bottle for the driver to drink. Really!? We’ve made our way on the Shinkansen from Kyoto to Hiroshima leaving behind Shoguns, Geishas, Kimonos and Pagodas and ready to see a new city. It was a quick two hour ride on the Shinkansen. After arriving in the early evening, we set out to grab some dinner. 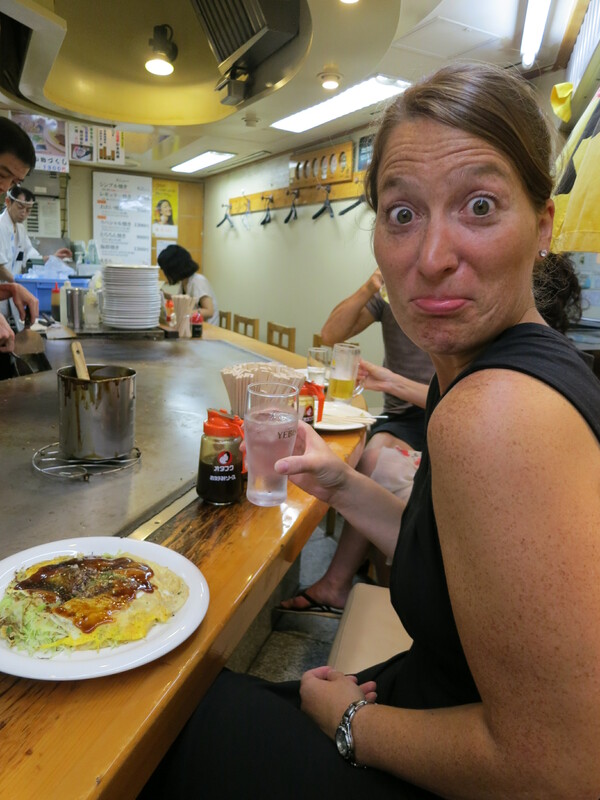 Very quickly, we discovered Okonomiyaki – Hiroshima’s signature dish. Okonomiyaki is best described as a noodle pancake loaded with cabbage, sprouts, egg, meat and more – all cooked on a griddle. Locals take pride in their Okonomiyaki and it is as ubiquitous as chili is to Cincinnati or deep dish style pizza is to Chicago. The verdict? Inexpensive and tasty! Can’t wait to go back tomorrow for another round before we head out of town! The very friendly owner of the particular restaurant we visited was insistent on giving me his card. You can visit his site here. Hiroshima is a lively, colorful city that uses street cars of all sizes, models and years as their signature public transportation. Running up and down the major streets, the street cars are the main way we’ve been getting across town. After a relaxing night at Hiroshima’s wonderful Hana Hostel, we made our way to Peace Memorial Park and The Peace Memorial Museum – part of a whole complex dedicated to the memory of the atomic bombing of Hiroshima and to creating lasting worldwide peace.. 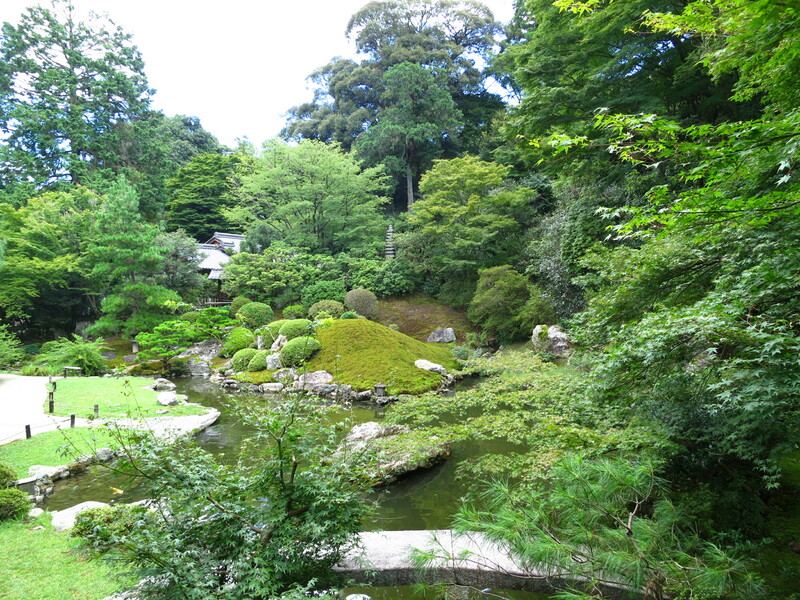 The museum and park certainly qualify as “must visits” in Japan. 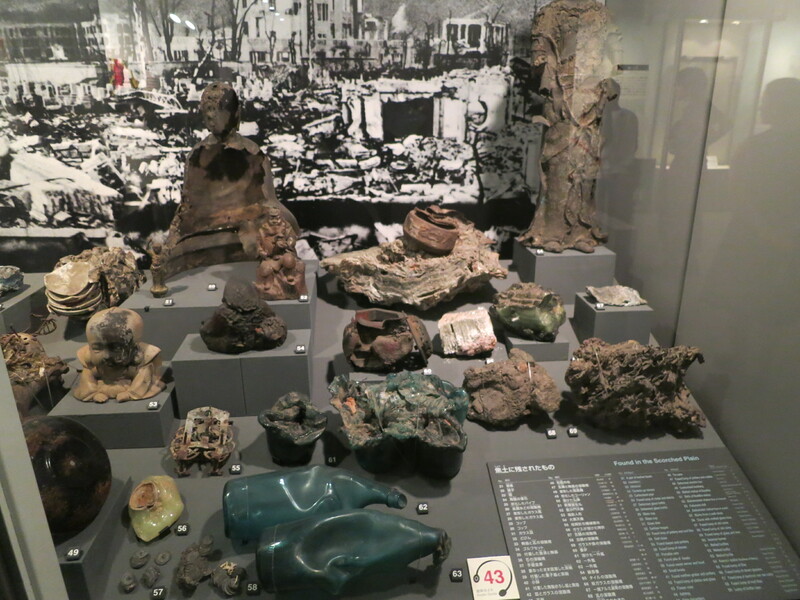 The nearly-free museum is well done, informative and paints a complex picture of the really widespread, horrific destruction done by the atomic bomb. It was interesting and informative and solemn, but structured to teach and share to make sure that all remember. Brooke and I walked away glad we took the time to tour the museum and grounds surrounding this incredibly important, watershed event in human history. It is also the first time we’ve really come to understand the specific impact of an atomic attack on a specific place. The museum has such a tactile component with archives full of items from the blast that you can touch and hold. Showing these human, personal items helps to establishes a more intimate connection with what happened here 67 years ago. One eye-catching exhibit was the stopped wristwatch reflecting the exact minute that the bomb went off- it is literally a snapshot of time. The personal stories and archived items, and especially the photographs from the city after the bombing are unsettling, but that’s to be expected and kind of the point. We found it really interesting how the current generation of Hiroshima locals really shoulder the city’s legacy from the past. The city is a rebuilt place, but they are urging people to never forget what has happened here. The museum has a clear focus on their dedication to peace and ending nuclear proliferation. In fact, the sitting mayors of Hiroshima have sent a letter of protest to a country each time their nation has tested an atomic weapon over the last forty years. Copies of these letters fill up two or three full walls within the museum. We also applaud their mulit-lingual exhibits that show the desire to spread peace across all peoples. I get that this is supposed to be a message of warning, but it does sort of make the future looks grim and bleak. I saw a sign on the way out indicating that this should be a “warning to future generations.” Indeed. After leaving the museum, meandering through Peace Park was its own striking experience because you’re standing in the near exact bombing spot that you had just studied inside. 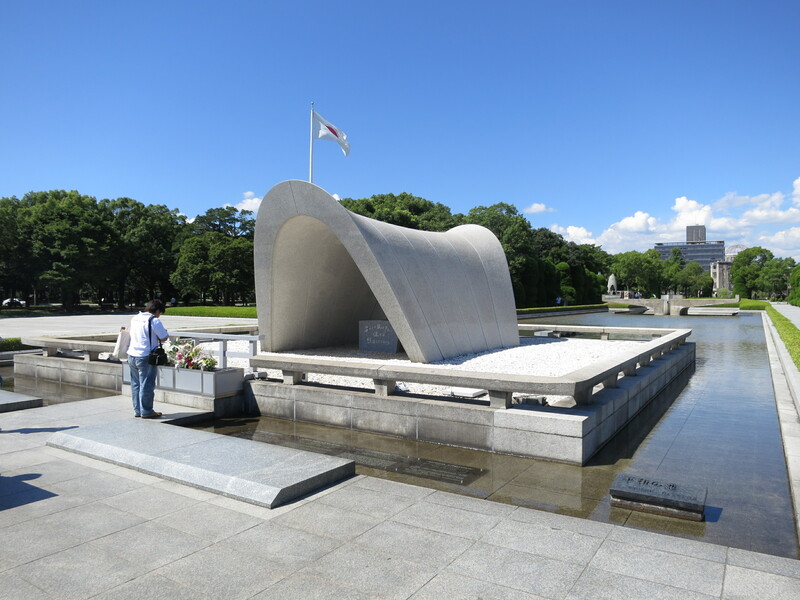 It’s all preserved green space now with the cenotaph, flame of peace and the Childen’s Peace Monument which was built in a response to the well-known story of Sadako Sasaki- the cancer stricken girl who made a 1,000 paper cranes. Is is an astonishing tale that’s simply heartbreaking. 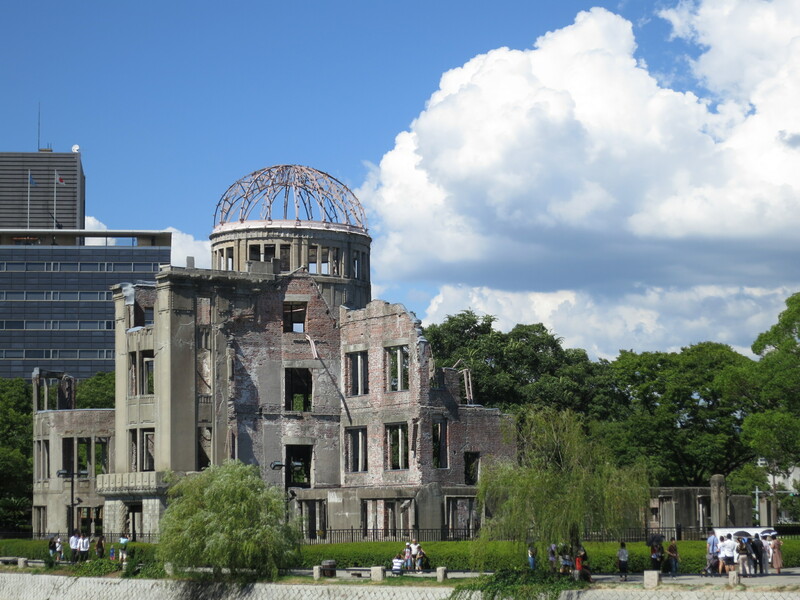 The most notable building was the so called “A-dome” structure: the shell of a building close to the center of the bombing that was one of the very few to remain intact. We walked away from the area and took some time to compose our thoughts and consider our experiences. 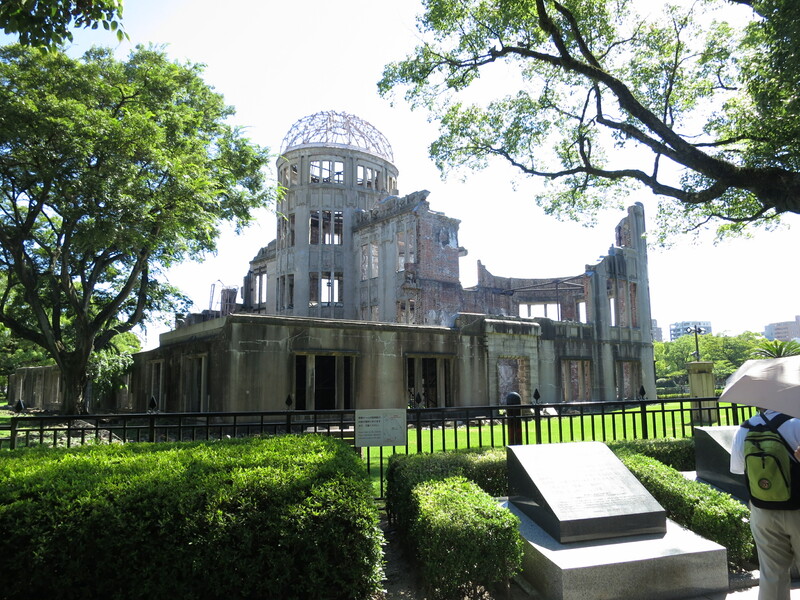 Hiroshima is in no way a depressing city and its desire to be focused on peace rather than tragedy is quite clear. We understand why some people may avoid visiting this city, but we would definitely try to convince them otherwise. No matter what your political views or beliefs about nuclear weapons, the story of Hiroshima and its people deserve our attention and remembrance. There is more to our visit to Hiroshima which is a bit more uplifting and fun, but we will tell you all about that tomorrow. Another view of the really striking A-dome. It’s been preserved to look exactly as it did right after 8:15 AM on August 6th, 1945. Everything else around it was just obliterated. Almost everyone we spoke to before arriving in Japan told us we should visit Kyoto. 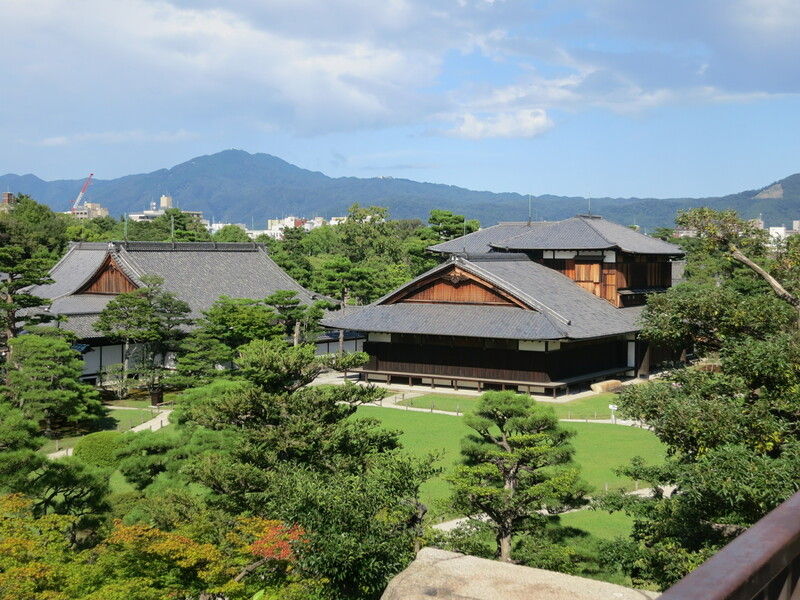 It is known for its traditional Japanese buildings, its overwhelming number of shrines and temples, and its beautiful gardens. It is at the top of every Japan Tour list and so we decided it was a “must see” for us. We are so glad we made a visit. 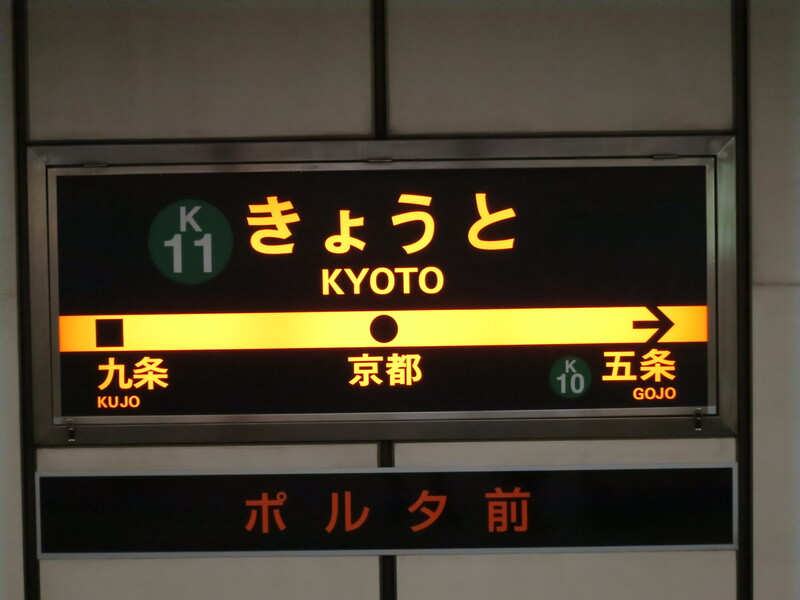 We arrived in Kyoto yesterday evening after taking the Shinkansen (bullet train) from Yokohama. It was turning dark, raining and not really the right time for sight-seeing, so we did what we do best–explored the restaurant and bar scene! Everyone who has ever been a poor college kid (or who was raised in a house with my mom) has had their fair share of Ramen noodles–you know, the hard brick of noodles with the flavor packet. You may have had the Cup-o-Noodles variety. I’m sure you are familiar. Don’t get me wrong, they are great and perfect for cheap eating. But that little 49 cent pack of Ramen barely comes close to resembling the real thing. We tasted our first real Ramen at Ippudo which sits nestled within the tightly packed streets of the Nishiki Market district. We spied the food in front of the people next to us, pointed to their dishes and the picture of dumplings on the menu, and our order was complete. While we waited we watched our neighbors eat Ramen with chopsticks and a spoon so we would know the etiquette. Slurping is totally allowed and putting your lips up to the side of the bowl is expected. Thank goodness! 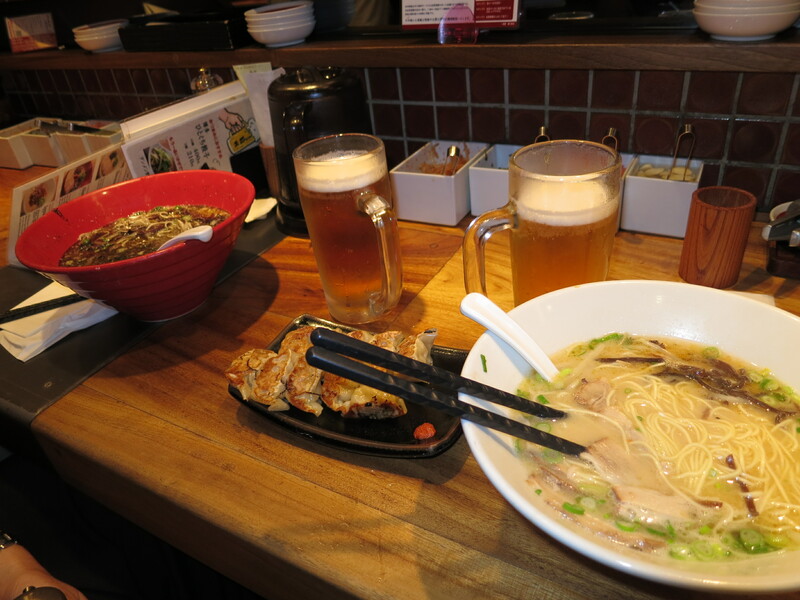 When our huge bowls of steaming hot Ramen arrived, we had broth flying everywhere! The flavor combinations were really amazing with fresh scallion and some delicious peppery oil drizzled on top. However, the real highlight of the meal were the Gyoza, Chinese style dumplings. These were like little bites of heaven–easily the best dumplings I’ve ever had. After our delicious dinner, we made our way to some bars. Our first stop had us trying our hand at darts fairly unsuccessfully. We left there defeated and once again found a tiny little alley and wandered down it to see what was happening. It was so cool–door after door were bars with people lined up on stools taking turns singing karaoke. Well, we couldn’t resist! We are in Japan after all. We went into one that was essentially empty and took it over by singing everything from Bon Jovi to the Backstreet Boys. It was so tiny that when we sat on the stools our backs were up against the sliding doors. It was essentially a hallway. The bartender brought us this crazy looking plate with fish and noodles (which we didn’t ask for or want) and continued to chain smoke while we sang. We were having a blast in this cramped little space, until the bill came. We couldn’t believe how expensive our two beers were. It turns out, we think we were being charged for each song we sang. Crap! We had no idea and we tried asking, but she spoke no English at all. Oh well, that was a tough lesson learned. This morning, we hit the ground running and went to Hagashiyama, an area in Kyoto loaded with shrines, temples and gardens. Wow, we fast-paced New Yorkers could really learn something from these Buddhists. We first went to Shoren-in, an ancient temple complex which is no longer in use. After taking our shoes off, we strolled along the tatami mats and wooden walkways of the temple buildings. 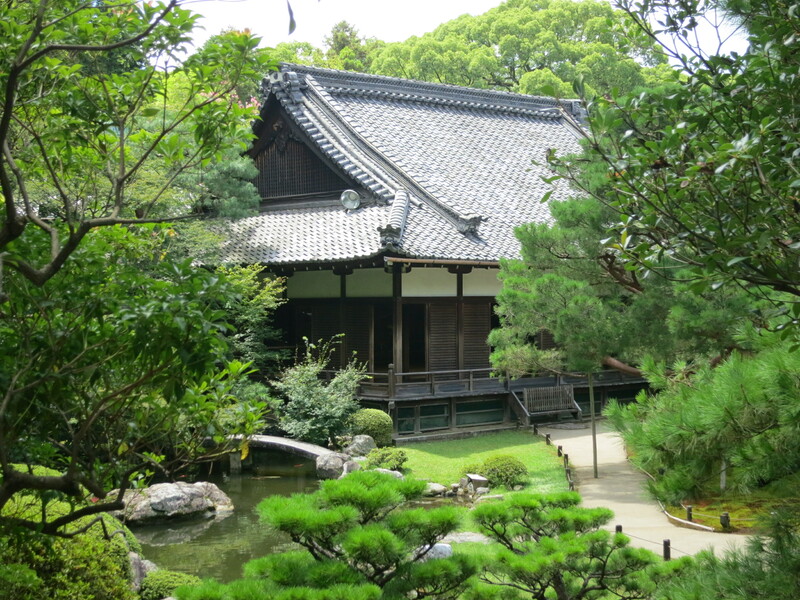 In the center of this serene complex lay a beautiful garden with a koi pond. We found ourselves just sitting there, listening to the singing cicadas and rush of the water. Relaxing isn’t even the word for it…more like, peaceful. My brain felt clear and still. I can completely understand why people would come here and pray. We both agreed the equivalent to this would be amazing in New York City. Not far from Shoren-in, we walked to Chion-in. This is another huge temple complex, but it is still actively used today and is a popular place of pilgrimage for Buddhists. 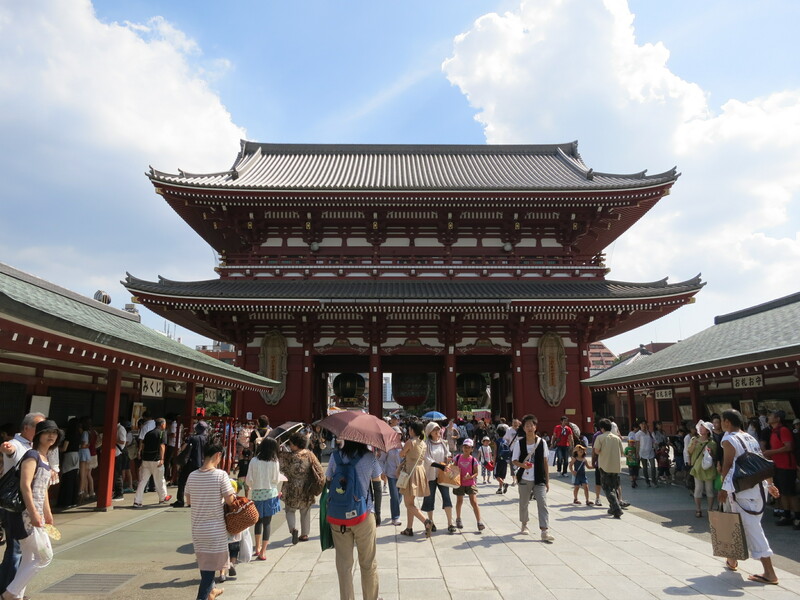 Unlike the other, this temple was bustling with people and activity. We could hear chanting and bells ringing and there were certain places where we could not go because there were people worshiping. The coolest part of this temple is the San-mon, the gate at the main entrance. 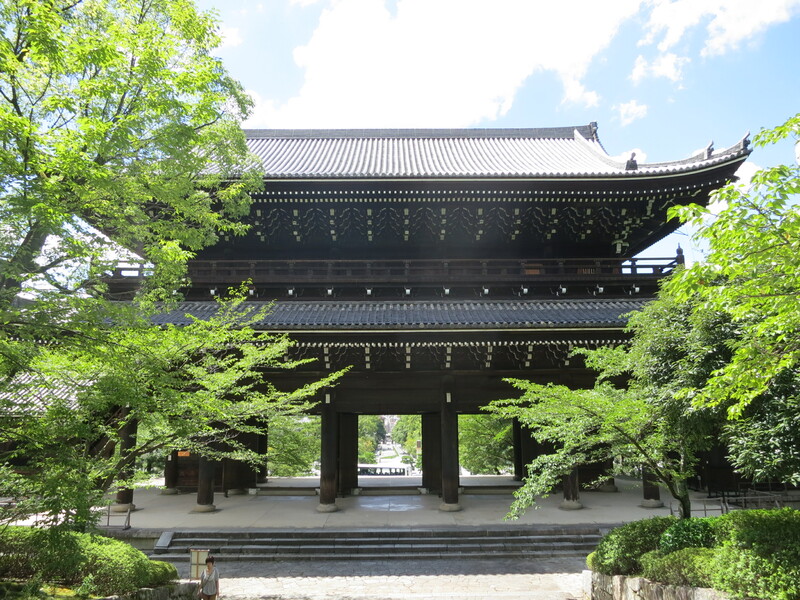 It is the largest temple gate in Japan and let me tell you, it is huge! Pictures really don’t do it justice. After seeing a few temples, we were in the mood for something a bit different, so we headed to Nijo-jo, a castle built in 1603 which was the official residence of the first Tokugawa shogun (essentially a military dictator). The castle and its grounds are absolutely gigantic! We were unable to take pictures (or even sketch them, not that we would have) inside the building, but we basically understood that the shogun was the most important person in the room and all activities revolved around him. For his protection, the castle is surrounded by both in outer moat and another inner moat. However, if some stealthy Ninja warrior managed to get past both moats, they would have a hard time getting past the “nightingale floors.” These are floors which “sing” each time they are stepped on so intruders are unable to come in unnoticed. (I think Phil’s mom should have had these floors installed in the house he grew up in to keep him from sneaking out while she slept.) The movement of the boards really does cause them to creak at each step–very clever, shogun. Very clever, indeed. 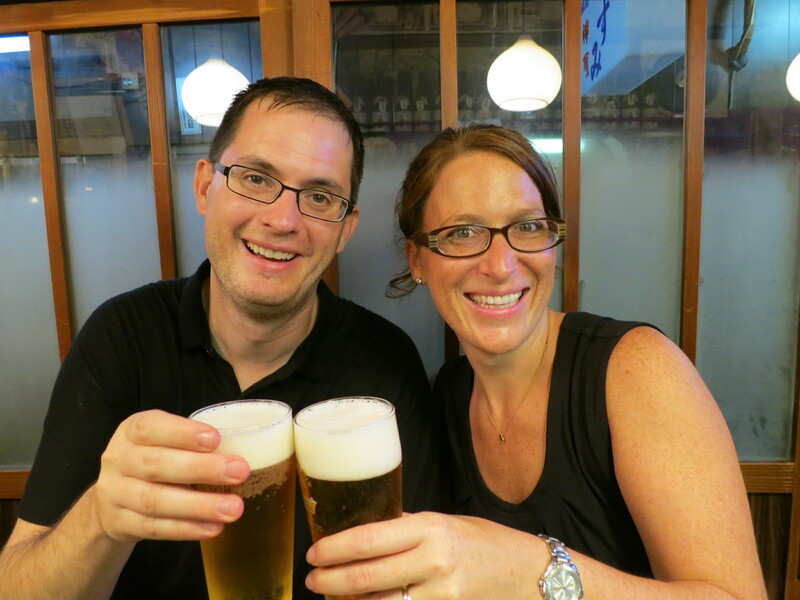 After traipsing around Kyoto in the crazy-hot sun, we found ourselves exhausted and ready for a rest. Luckily, a smooth and air-conditioned ride on the Shinkansen awaited us. And so, we said goodbye to Kyoto feeling much richer in our understanding of Japanese culture and history. Now we attempt to understand modern history as we head to Hiroshima. We both anticipate being disturbed by some of what we will see there, however we feel it is important to pay our respect and gain a greater understanding of this city and the events which took place here so many years ago. One of many instances when we wish we could read Japanese. What is this sculpture? 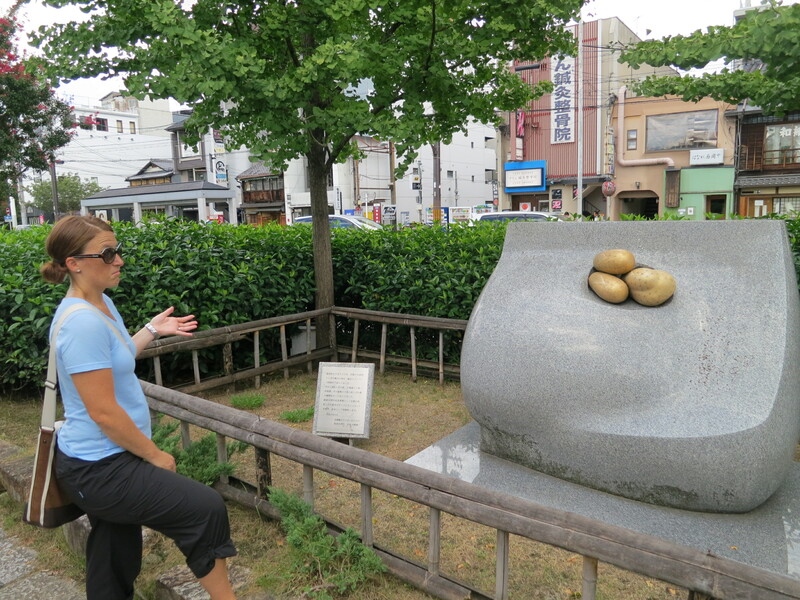 It kind of looks like potatoes on a big rock, but that can’t be right. 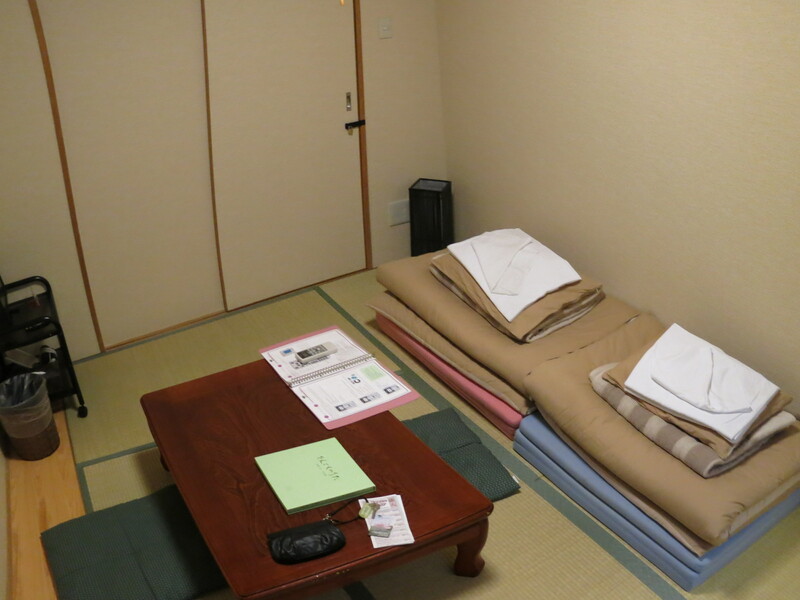 Our traditional Japanese style room at Hana Hostel, complete with tatami floors and mats to roll out for sleeping. 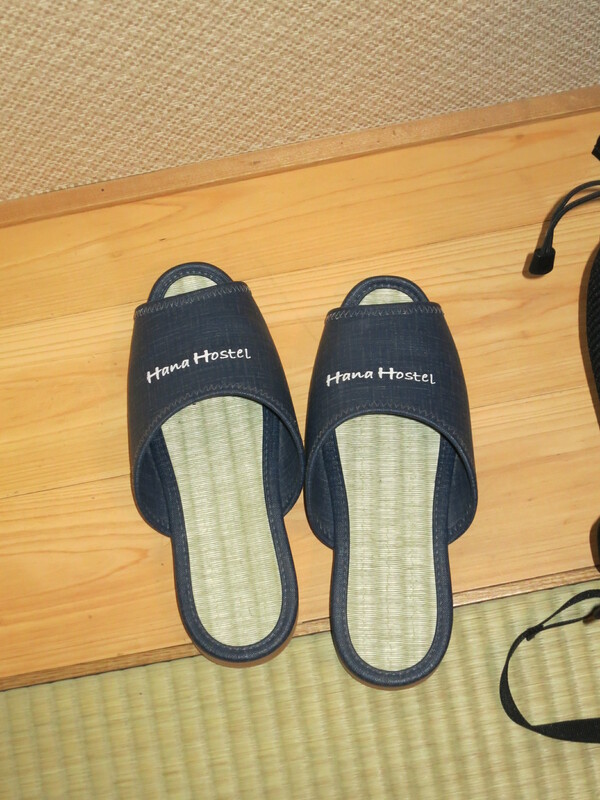 Since guests are not allowed to wear shoes inside Hana Hostel, they have dozens of these slippers upon entering the building. 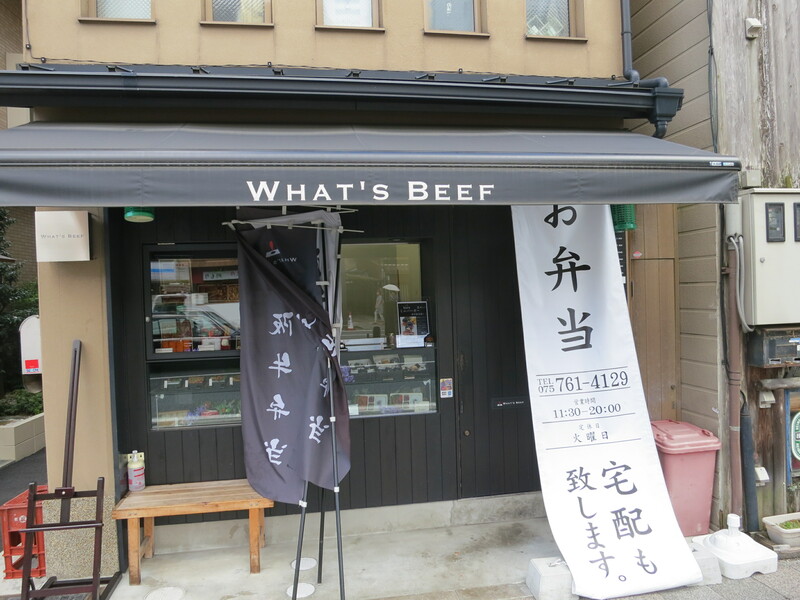 After five days in Japan, we’ve noticed a million examples of how things are slightly different here. From the insanely loud Pachinko parlors that resemble slot machines on crack to the ubiquitous bowing. But the one that strikes us over and over is that train travel in Japan is both astounding and outstanding. The traveling Kollineisers have been continually in awe of this vast and extensive rail network that runs smoother than seems possible. In fact, aside from the power of our own two feet, train rides have been our sole mode of transport since arriving. I really, really wanted to avoid throwing up this tired cliched mantra, but it is unavoidable: the trains in United States look like a half-hearted joke when compared to those we’ve seen here. (And yeah, probably Europe too, but we haven’t made it quite that far yet). 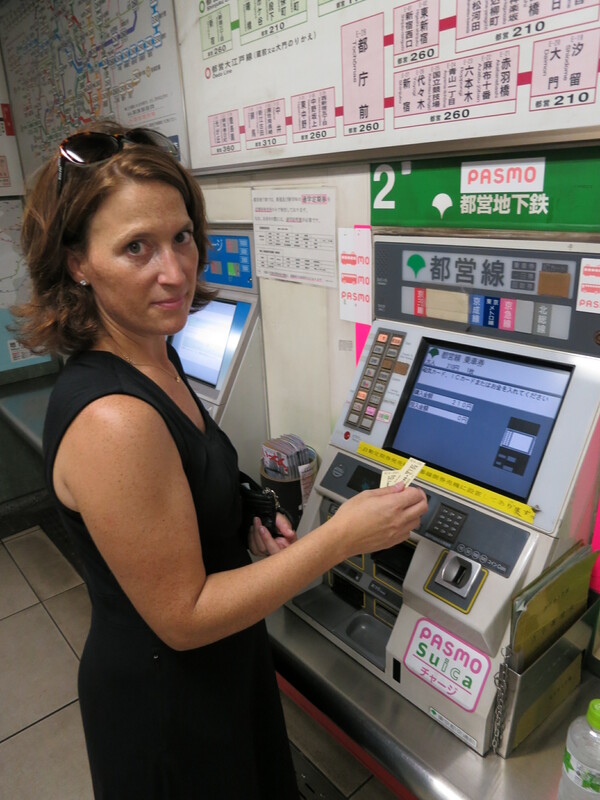 Before arriving, we purchased the seven-day Japan Rail Pass (the JR Pass) that must be purchased outside of Japan in advance of arrival. At around $350 per person, that pass wasn’t cheap, but it has already paid for itself twice over. It has been easy to use and one of the best purchases made to date. In fact, short of subway rides, it is the only transportation cost we’ve incurred. And to be candid, it helps that I love trains. I always have. 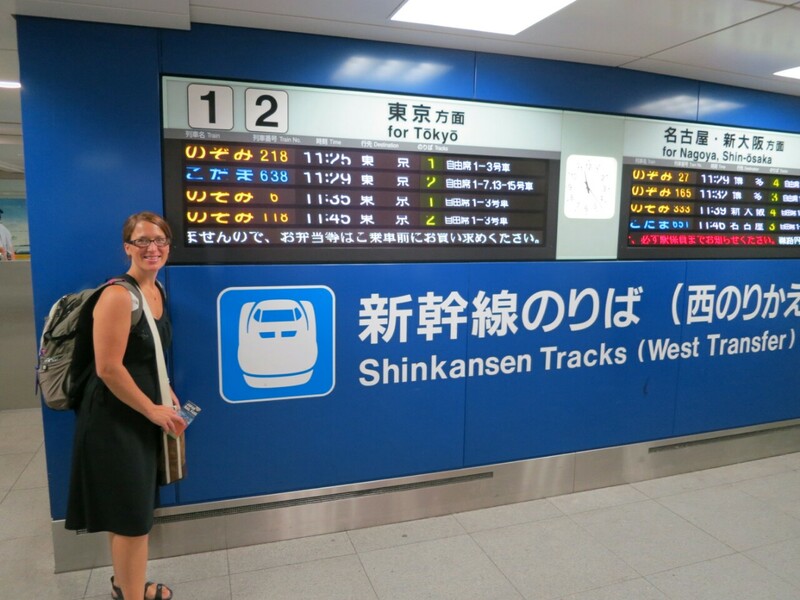 We’ve had a chance to ride the regional rail, Subways in Kyoto and Tokyo and even the Shinkansen (aka the famed “bullet train”). 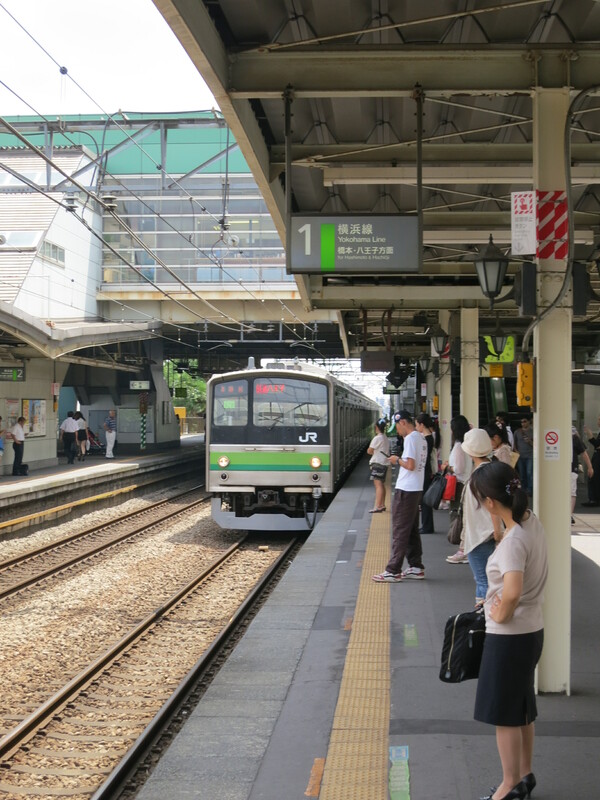 Our first experience was on the regional rail – the line of trains that connect city to city in and around Tokyo and continues through the rest of Japan. It starts with a never ending rail map that seems to have infinite possibilities and infinite stops. It took some time and patience, but with the help of some stop names in English, we were able to decode the rail map sufficiently. I’d rather not mention that this was a map that included only PART of the Tokyo system, but I’ll include that admission for the sake of accuracy. So far, we haven’t had to wait on a train for more than, say, seven minutes at most. At first, we chalked it up to some solid train luck, but the reality is that they just always seem to be pulling into the station. All of the train schedules – and even all of the seemless connections from line to line – are planned to such a methodical timetable that it would make the most dedicated clockmaker cry like a baby. On all the trains we’ve ridden, people line up directly behind the space on the platform where the doors will open. Polite and organized. (Keep in mind, we haven’t been on the subway during rush hour which sounds like it could be much different.) While everyone has a mobile device in their hands, everyone avoids talking on their cell phones. My absolute favorite part is that each train line has their own unique, fun jingle that plays when the train doors are about to close. No boring chimes here, more like friendly little tunes that sound like you just hit the jackpot on a slot machine. And with so many trains, you end up having not just express service, but some crazy, multi-station skipping service called “Rapid Super Express” service. On top of all that, the trains are all remarkably clean. It’s possible we’ve just been riding at the right times, but we’ve seen no graffiti and no trash. Brooke and I spent the last six years riding the NYC Subway just about every day, so we were interested in comparing the two underground labyrinths. To start, each car ends with a giant glass door that allows you to see into the next car. When everyone is seated, you can literally see from one end of the train to the other which makes for a more exposed experience. We’ve also seen doors and sometimes full walls that are on the station platform. They line up with the train doors and, in theory, prevent a rush hour passenger from falling onto the tracks. Finally and probably more importantly, each station has a designation like “N5” or “A10” (letter for the line, number for the stop) and a sign indicating which direction the train on these track will go and what the previous and next stop will be. Genius! That already saved us going in the wrong direction before we even got on our first train! Thanks, Japan! Similarly, the stations have maps indicating the time in minutes to the future stations on the line. Seriously, these are such simple, amazing ideas that Brooke and I need to import ASAP. In the stations, we’ve even managed to see a few women (and a handful of men) wearing traditional Kimono outfits. We’ve seen signs that during rush hour times, there are trains that are “Women Only.” Pretty sure that one is to dissuade the icky gropers. As if that weren’t enough, each station on the regional rail (JR lines) have a nice set of shops and in some cases giant malls attached to the buildings. For the nerd in me, It has been a giant thrill learning and mastering a complicated new train system, exploring the trains themselves, and discussing complicated routes with Brooke. Talk about getting some insight. I became dangerous when I finally scored a quality map. It’s been my new best friend. However, we should point out that there is no 24 hour rail service in Japan. We haven’t found any trains that run much past midnight. I guess NYC’s 24-hour subway scores a win in that category. Well, that and you have a more intriguing set of smells on American subways. Overall, it is a simply amazing system. Sensational! But beyond all of that, the single most impressive thing is that Brooke and I haven’t gotten on the wrong train once yet. Trust us, it hasn’t been for lack of trying. Give it time. PS – We’ll do a full write up of the Shinkansen in a few days!